Lashing and securing is very important, but make no difference if your packing is not sea- or air-worthy. As there are many kinds of cargo, there are many kinds of packings. 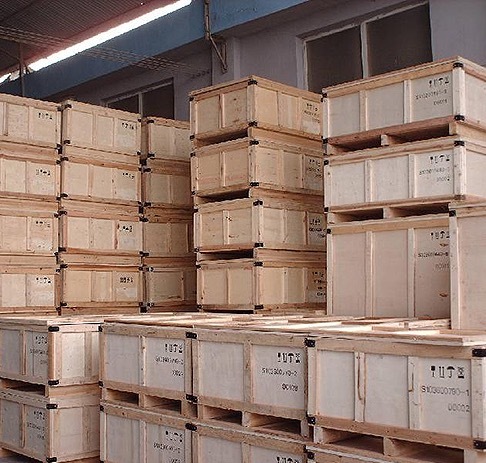 Most common are cases, crates, pallets and drums. Some cargo only needs a crate, other cargo maybe need protection from humidity and other circumstances. Export packaging products are engineered to protect from stacking pressures, vibrations, drops, and climatic stresses or moisture– as well as from bending, cutting, or compression. Different kinds of blocking materials are used to immobilize products. Void-filling materials are used to fill the empty spaces around the packed product for secure transport. The materials used for air freight will be different from sea freight. As the prices for air shipments are based on the weight, the packing should avoid bringing useless weight. For sea transportation, the material needs to be stronger as the transport takes a lot of time and the cargo will be under higher preasure. Mostly heat treatment of wooden packing is imperative. The packing should make the manipulation (load / discharge) easier, not more difficult. In case of breakbulk : slinging points should be visibly marked on the export packing. Export packing should be sufficient for the means of transport for which it will be used. whenever you need an offer or know-how.